Things are getting busy in our house. Alongside all the usual craziness, there are final exams to study for, Christmas pajamas to be made, holiday cards to be written, and that is before we even start on all the holiday baking and craft projects on our ever-increasing ‘To Do’ list. Every morning we hit the ground running, so anything that can be done to make mornings a little more streamlined is very welcome. 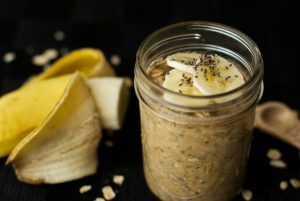 Enter… these peanut butter banana overnight oats. Tasty? Check. Made in advance? Check. Packed with protein? Check. Full of fiber and omega-3s? Check. Easy to make? Check. What more could you ask for? The combination of oats, peanut butter, and banana will most definitely keep you feeling satisfied through the morning. Most of the sweetness comes naturally from the bananas, with just a little touch of maple syrup. And as long as you use gluten free oats, this breakfast is entirely gluten free. Add all of the remaining ingredients and mix well. Pour into mason jars or some other small container with a lid. Place in the fridge overnight (or for at least 2 hours).